Over recent years wood look tiled floors have become a fashion trend as they emulate real wood while being easier to maintain, but are they the right choice for you? Are their supposed benefits so good? If it is the appearance of wood or , you are seeking, why not go for the real thing? 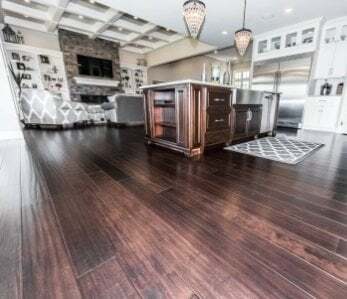 This kind of choice often has us running round in circles trying to make up our minds, so we will make your life easier by providing a side by side comparison between bamboo flooring and wood look tile. 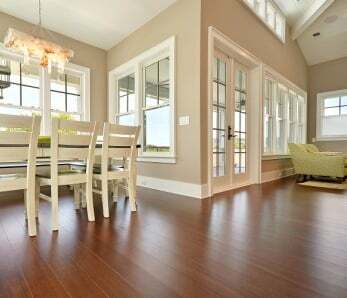 Bamboo flooring is one of the hardest wood floors out there and as such it is highly resistant to denting. It can resist heavy furniture without denting, and stand up to active pets and rambunctious children. The hardest bamboo option is strand woven bamboo which is 2-3 times as hard as oak as measured on the Janka Hardness Scale. We have no hesitation in giving it 10 out of 10 for resistance to denting. Being a ceramic material, wood look tile is also extremely hard and highly resistant to denting. It is difficult to compare the hardness of bamboo and wood look tile directly as they are measured using different methods. As we have said, we measure the hardness of bamboo and other hardwoods on the Janka Hardness Scale while we measure the hardness of ceramic tiles on the PEI (Porcelain Enamel Institute Abrasion Scale). Quality wood look tile should have a PEI rating of 3 to 5; anything less would be susceptible to damage. 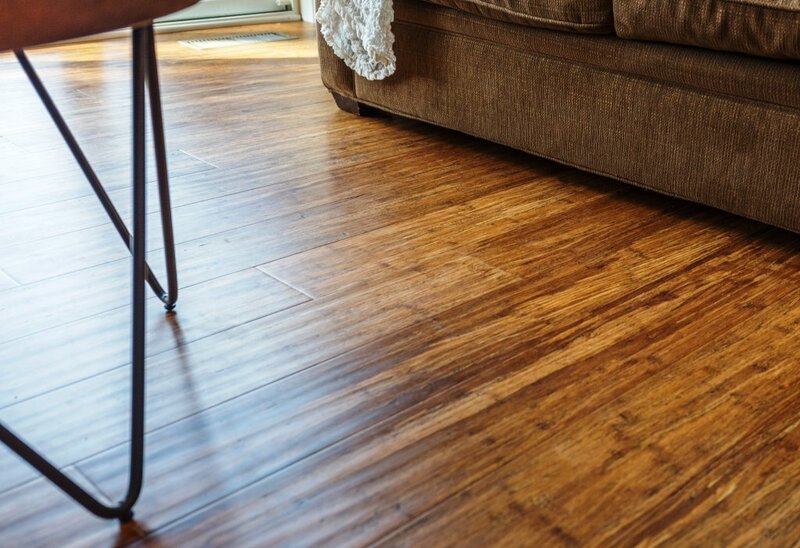 As with bamboo, we award wood look tile 10 out of 10 for resistance to denting. One of the reasons for the increasing popularity of bamboo flooring is its environmental friendliness. Although a bamboo plant might look like a tree, it is indeed a grass. Just as you can cut grass and it will regrow, you can cut bamboo, and it will also continue to grow. That’s why you can harvest a bamboo plantation, then leave it for a few years, typically five, and harvest it again without uprooting any plants. Doing this doesn’t damage the environment in any way or harm plants and animals. Growing bamboo is also a great way to remove carbon dioxide from the environment and counteract global warming. We score it 10 out of 10 for eco-friendliness. 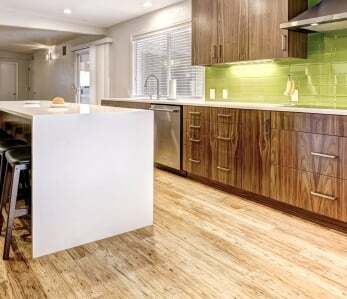 Wood Look Tile is also an eco-friendly material. Derived directly from the earth, it is necessarily a natural material. The only real downside is the amount of energy required to fire it in the kiln. Providing that energy from fossil fuels is certainly not good for the environment. 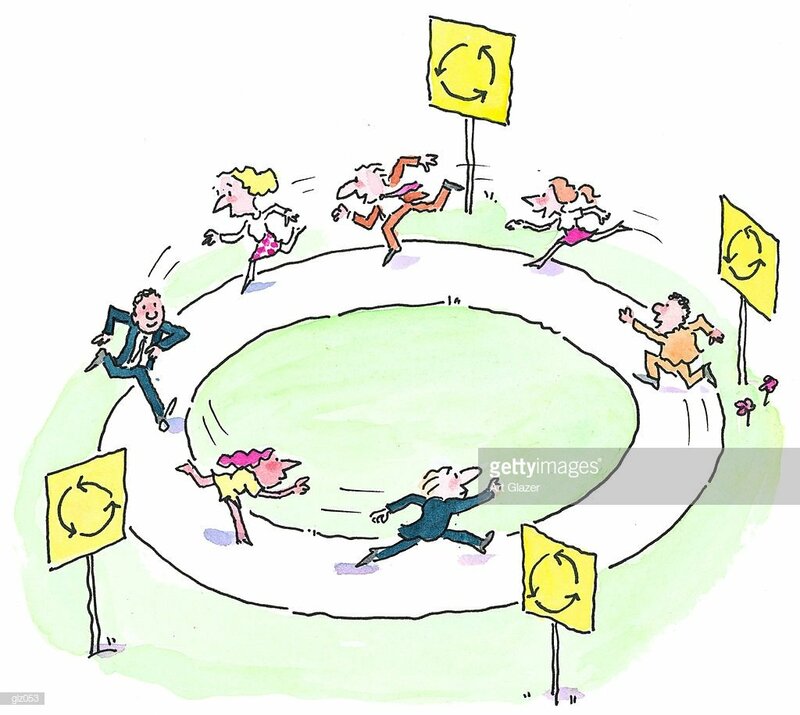 However, many modern processes recycle that heat using heat for use in other industrial and agricultural processes. Thus, we score it 9 out of 10 for eco-friendliness. Maintaining good quality air in our homes is a vital aspect of maintaining good health. Unfortunately, many of the materials we use in our homes emit volatile organic compounds (VOCs) that can cause us both acute and long-term health problems. Clearly, when we can do so, it makes sense to opt for materials that don’t degrade our home environment. Bamboo floors are almost entirely free from VOCs. 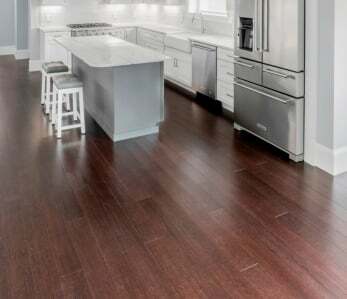 The only possible contaminant is the small amount of UF adhesive used in engineered bamboo flooring during the manufacturing process, however it’s so small and these floors are still very safe. For indoor air quality bamboo receives 9 out of 10. Similarly, wood look tile doesn’t emit VOCs, though the adhesives used to fix it to the floor can be a source of indoor pollution. 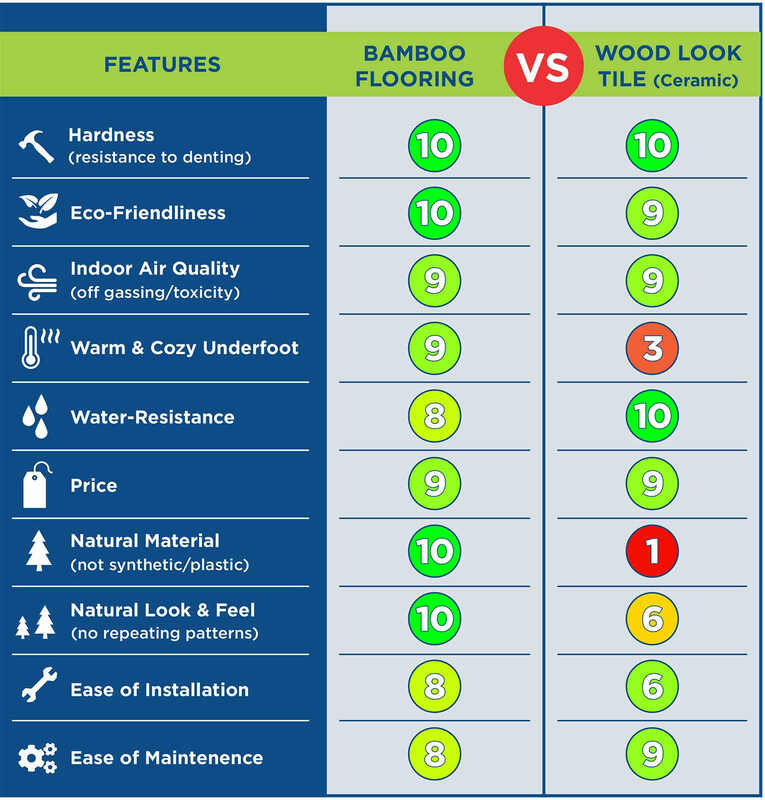 However, overall it is just about equivalent to bamboo flooring, so it also gains a score of 9 out of 10. Bamboo flooring feels nice and cozy underfoot, and that makes sense being that it provides excellent thermal insulation, so it never feels cold to the touch. It is great to feel a bamboo floor underneath your feet even on a cold day. Not only does it feel cozy, it looks cozy too, so it also provides a warm inner glow. It gets a well-deserved 9 out of 10. Being ceramic, wood look tiles have a high thermal conductivity, the opposite of bamboo. The reason they feel cost to the touch is they drain heat from your body making you feel cold. Even when a wood look tile floor is at the same temperature as a bamboo floor, the wood look tile floor will feel very much colder. This might be a difficult concept to understand, so check out our video for a better description of the effect. The bottom line is that wood look tiles feel cold; not much fun first thing in the morning; in fact, they feel positively chilly. They score just 3 out of 10 for underfoot warmth. 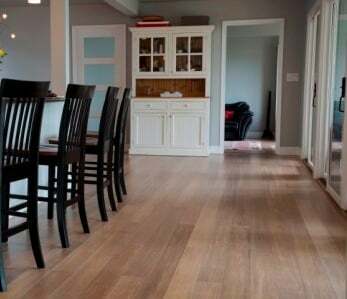 Bamboo flooring has better water resistance hardwood and is much less likely to be damaged by spills, but it’s essential to dry up any spills when you discover them and certainly not leave them there for over a day. If you do so, it is likely to result in swelling and leave behind a stain. While this bodes against installing bamboo flooring in areas such as bathrooms where the floor is expected to get wet frequently, it is sufficiently water resistant for most purposes, so it scores 8 out of 10. Wood look tiles are highly water resistant; in fact, they are one of the most water-resistant flooring materials available. You can safely install them in bathrooms and kitchens, and even outdoors and around pools. They deservedly score 10 out of 10 for water resistance. Bamboo flooring and wood look tiles are, square yard by square yard, similarly priced. Expect to pay between $4 and $7 a square foot. This price is significantly less than that for hardwood tiles. Regarding availability, both options are readily available for fast delivery — both score 9 out of 10. Bamboo is, as we have said already, a grass and entirely an organic natural material. Granted that some unnatural products are used in the production process, but the bamboo planks you nail or glue to your floor are 100 percent natural. It scores 10 out of 10 for naturalness. The raw materials used to manufacture wood-look tiles include clays, refined minerals, and chemical additives. These clays and other minerals are combined and pulverized using a variety of mills and other machines. The crushed materials are separated into various particle sizes, and glass materials are added to provide water resistance and decorative features. Next, the tiles are formed using dry pressing at pressures up to 2,500 tons or a combination of extrusion and punching. They are then carefully dried using heaters or microwaves, and the surface is sprayed or printed with various glazes. Finally, the tiles are fired in a kiln. Typically, the firing temperature is around 2,100 to 2,400 degrees Fahrenheit and process can take several days. While tiles do use natural clays, they are an entirely synthetic product. On a scale of one to 10, wood look tiles score just a single point for organic naturalness. Bamboo flooring has a beautiful natural variation in the grain pattern which creates a stunning effect, especially over large areas. In fact, this natural variation is one of the main reasons people choose bamboo. Every board is unique, and no two bamboo floors are the same. Your bamboo floor will be individual to you. It achieves 10 out of 10. While the finish provided by wood look tile is undoubtedly attractive, and there are finishes available that emulate just about any wood. They do it well too, and at first glance, you can easily mistake them for the genuine article. However, once you start to look closely, you will soon make out the repeating patterns that betray the fact that they are indeed synthetic. They don’t look as good as real bamboo, but they do gain 6 out of 10 for their look and feel. For more information on this please follow the links to our installation guides. And if you don’t want to do it yourself, there is no shortage of professional installers you can call on. For ease of installation, we report an 8 out of 10. Somewhat more difficult than bamboo, it receives 6 out of 10 for ease of installation. Bamboo floors are easy to maintain – exactly like most hardwood floors. You need to clean them on a regular basis to avoid the build-up of grit and other debris that could scratch the surface. We recommend a weekly sweep or vacuum and then a lightly damp mop. Avoid excess water and . You should wipe up any spills when they occur using an absorbent cloth. Really, this is a simple common sense cleaning regimen; there is nothing too complicated. We give it 8 out of 10 for ease of maintenance. Wood Look Tile floors are easy to maintain, even easier than bamboo. They need regular vacuuming or sweeping possibly with a rubber broom if you have pets. Mopping them on a weekly basis will keep them looking good. We suggest you use a neutral cleaner and avoid bleaches or anything abrasive. Since it is slightly easier to maintain then bamboo means it receives 9 out of 10.